What beautiful images. I enjoyed these and the others on your beautiful blog. Unfortunately, I cannot give advice about over wintering plants as it does not get that cold here. My twin brother just moved to CT from Mill Valley just north of SF. He said he is going to have to re-think plants, and bringing less hardy ones in. So, he may end up asking you for advice! I love the silver contrast with the salvia in the earlier post,too. as one with no good windows, your on your own. and I would imagine what just hit PA has passed through Ohio, this is not late fall wind chills. The garden is now on its own till spring emerges. however, the biologist in me says, why not experiment. no data is bad data. though in this case it may joyful vs sad data. good luck. Honey? Yes Dear. Do you hear that? Hear what. Shh! There it is again! I don't hear anything.... Just listen--there it is again, it sounds like, like.... Plants in the attic! Get out! Well, anyway, your ninebark is very lovely--I hope my coppertina soon looks like this. Hey Philip, you might want to tell him to wait until next year to ask... *grin* It looks like I'll just be experimenting this year, so maybe next year I'll at least have some data to go on if asked for advice! Stratoz, yes... it has passed through here, and will continue to be cold this week. I have put on my storm windows, and that's part of the whole problem. All of the plants that I knew had to come inside, are now sitting on my kitchen floor in various states of distress... some potted up, but other still in bags. lol. Ah well. Hey I just posted about this and your very plant!! Your attic will be totally fine for the zone 8s (read a trench mani for how cold I let my plants get!) and according to our esteemed speaker at Bwold last week, you can put the cordyline in the basement (in the dark!). 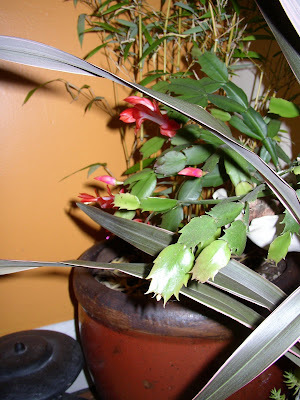 Plus your plants will slow down for the winter and not need as much water - maybe check them every 2 weeks or so. Is there possibly a computer calendar program somewhere (my total computer ignorance is showing) that would email a reminder to water your plants! Beautiful vignettes! 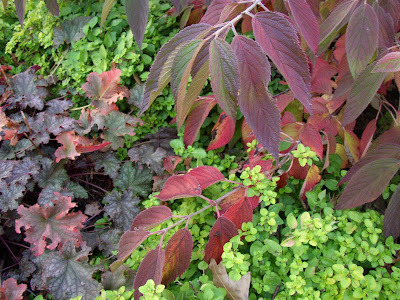 I love the heuchera with the golden oregano and viburnum adds even more to the combination. Hi Kim. I'm going to say yes you can put them in the attic, based on what I did a couple of years ago with a rose tree that was potted. I didn't want to leave it outside, so I put it in our unheated garage, with very little light (just what came in a window at the top half of a regular door). I only watered it a couple of times all winter and I'll be darned if that thing didn't start showing green growth around the end of March! I started watering it a little bit more then, and when it was a little warmer outside, I planted it in the ground. I realize your plants are not as hardy as a rose, but your attic won't get as cold as our garage, either, where it is below freezing much of the winter. I like the dirrerent shades of golden, grenn and red in your pictures - they make great companions! I'm starting up a new meme for Fridays - Blooming Friday - it would be great if you would like to participate with one or two pictures of blooming plants. I thought it would be nice to share eye-candy for the week-end... Welcome! Kim: Great colors in the garden and with those leaves, who needs flowers? Trust Kris. She knows of what she speaks! Your photo of the clashing Physocarpus foliage with the arbor made me laugh. 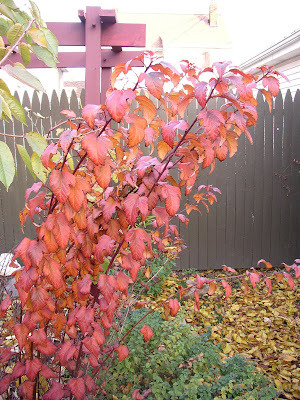 Autumnal foliage changes present such a fun challenge to garden design. I say experiment all the way! My mom always puts her geranium in a NORTH window in the unheated northern Indiana basement for winter, watering it maybe twice the whole time. It's a beautiful monster every summer.